LONDON--(BUSINESS WIRE)--Technavio analysts forecast the global online jewelry market to grow to USD 30.42 billion by 2021, at a CAGR of close to 17% over the forecast period, according to their latest report. The research study by Technavio on the global online jewelry market for 2017-2021 provides detailed industry analysis based on the product type (fine jewelry and fashion jewelry) and geography (the Americas, Europe, APAC, and MEA). 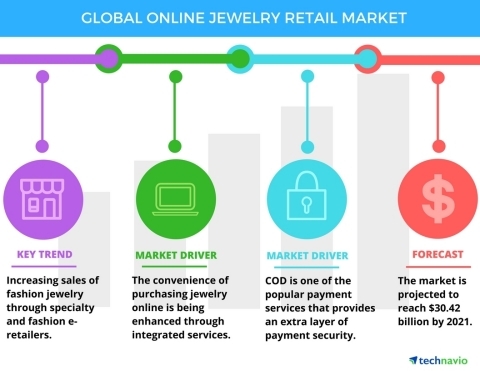 The Americas are the leading regional segment of the global online jewelry market, expected to generate the highest revenue and maximum incremental growth over the forecast period. The proliferation of leading jewelry manufacturers through online portals is the major growth driver for the market in this region. “Global jewelry manufacturers are focusing on both product and process innovation to differentiate their brand. Such proactive measures provides the vendors with a competitive edge and new customers, thereby increasing their share in the market,” says Poonam Saini, a lead analyst at Technavio for retail goods and services research. Vendors innovate their products either in the form of a radical breakthrough or as an incremental innovation driven by technological advancements. The two major technological trends currently dominating the fine jewelry manufacturing sector include computer-aided design (CAD) and rapid prototyping (RP). Global internet penetration rates are increasing rapidly, creating ample opportunities for enterprises to enhance their consumer bases and thereby their reach in the market. Rapidly rising Internet penetration has directly impacted the expansive growth of the m-commerce industry, further boosted by the rising adoption of smartphones and tablets. Manufacturers and retailers of jewelry items are quickly realizing the potential of online retail and are launching innovative and easy-to-navigate websites to extend their distribution channels and market reach. Effective use of digital marketing tools further promotes these online platforms. “The rapid urbanization and rising purchasing power of consumers have led to a shift in the lifestyle of consumers in both developed and developing economies. While the rise in disposable income has resulted in increased jewelry spending, the digital mindset of the consumers is driving the online jewelry market,” says Poonam. Countries such as Brazil, India, and China are major contributors to the market. Also, several developed countries in the Middle East have shown a quick preference towards online jewelry platforms. The rising demand for fashion jewelry is expected to drive revenue generation in the Americas. Become a Technavio Insights member and access all three of these reports for a fraction of their original cost. As a Technavio Insights member, you will have immediate access to new reports as they’re published in addition to all 6,000+ existing reports covering segments like apparel and textile, luggage, and pet supplies. This subscription nets you thousands in savings, while staying connected to Technavio’s constant transforming research library, helping you make informed business decisions more efficiently. Technavio has announced the release of their Global Online Jewelry Market 2017-2021 report.